Hawk Mountain Sanctuary, the oldest and largest member-supported raptor conservation organization in the world, has selected acclaimed raptor conservationist Dr. Laurie Goodrich as its next Sarkis Acopian Director of Conservation Science. The decision follows an extensive international search to replace Dr. Keith Bildstein, who retired last year. “Laurie is exceptionally qualified and her skill set is multi-dimensional and cuts across our organization. She has the ability to resonate with supporters and translate complex conservation issues into workable solutions,” says President Sean Grace. “The staff, board and volunteers are proud to have her lead the Sanctuary’s world-class scientific research and training programs,” he adds. Goodrich has worked in virtually every aspect of conservation at Hawk Mountain, from overseeing its long-term migration counts, to directing its education program and developing the first education plan, to conducting scientific research and publishing more than 50 peer-reviewed papers. She helped to raise and steward more than $1 million in grants or gifts for conservation science and education, including a transformational gift of $500,000 to expand raptor conservation education, and more than $2 million for land conservation. Now, she looks forward to expanding on that work. “Hawk Mountain has a unique opportunity to collaborate with talented scientists around the world, expand our education programs to encourage raptor conservation globally, and build even stronger partnerships with our friends in the field,” Goodrich says. “This work will benefit raptors, and when raptors do well, so do the people who enjoy watching them,” she adds. Goodrich is considered exceptional in her ability to bring people together to foster successful long-term conservation. Locally, she launched the collaborative Pennsylvania Farmland Raptor and The Broad-winged Hawk research projects, and globally, she co-founded the now world-famous, million-raptor conservation site at the River of Raptors in Veracruz, Mexico. Working with colleagues at the Hawk Migration Association of North America, HawkWatch International, and Bird Studies Canada, she helped develop the award-winning Raptor Population Index Project, and contributed heavily to The State of North America’s Birds of Prey, the first comprehensive analysis of raptor populations across the continent. Combined, she has coordinated the work of dozens of volunteers, trainees, and graduate students, and interacted with countless citizen scientists. Goodrich joined the Sanctuary in 1984 as the first full-time research biologist and over the next decade launched long-term research on the effects of forest fragmentation on songbirds and co-published Hawk Mountain’s first scientific paper on raptor migration trends. In 1996, she planned and supervised the Sanctuary’s baseline biological inventory and in 2000 co-wrote the first Hawk Mountain Land Management Plan, a document that continues to guide land use and protection work. 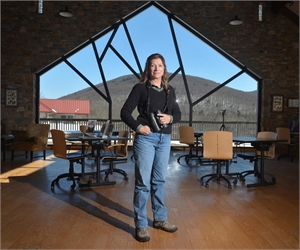 From 2010 through 2014, she served as interim Director of Education, overseeing Hawk Mountain Raptor Challenge initiative to successful completion as well as on- and off-site programming. She co-wrote the first-ever Hawk Mountain Education Plan, oversaw the first Raptor Educators Peer Workshop, and supervised the design and installation of exhibits in the newly renovated and expanded Irma Broun-Kahn Education Building. As director for all Sanctuary stewardship, Goodrich spearheaded big wins for land conservation, including a recent grant of more than $850,000 to protect 77 acres of prime farmland in the shadow of Hawk Mountain. Last year, she led a three-year project to protect the majority of the Sanctuary’s landholdings through conservation easement, work that ultimately will result in an estimated $1 million in carbon credit revenues over the next five years. With an MS in Ecology from Rutgers University, Goodrich earned a Ph.D. in Ecology from the Pennsylvania State University on the stopover behavior and ecology of autumn-migrating raptors. Her independent research helped identify the Kittatinny Ridge as a critical resource to avian migrants. She serves on the board of the Hawk Migration Association of North America and is a past board member of the Raptor Research Foundation and the Wilson Ornithological Society. She serves on the Pennsylvania Ornithological Technical Committee, is scientific advisor for the Pronatura Veracruz River of Raptors, and is an elected member of the American Ornithological Union. A volunteer for more than 15 years with Big Brothers and Big Sisters, she has served two townships in various planning boards or conservation committees. Laurie has received numerous awards for professional excellence, including from the Hawk Migration Association of North America, the Pennsylvania Society for Ornithology, Delaware Valley Ornithological Club, the Pennsylvania State University, and Pronatura Veracruz. “Today, threats to raptors are more complicated than when Rosalie Edge purchased the Sanctuary to stop the shooting of migrating hawks,” Goodrich says. “I believe Hawk Mountain conservation science working with education can significantly advance global raptor conservation,” she adds.